lluminate the underwater world at depths as great as 328' with Bigblue's versatile RGB-White LED Dive Light, which features a single four-color XML LED that produces red, green, blue, and white beams. The light outputs 30-250 lumens, depending on which color is selected. A supplied 18650 rechargeable lithium-ion battery provides a run time of four hours. 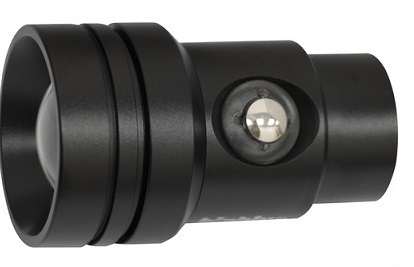 Additionally, the RGB-White's wide 85° beam angle makes it a good light for video recording or general diving. The white beam's color temperature is approximately daylight-balanced, allowing it to restore hues that are absorbed by the water. With the red beam, the temperature is lowered in order to create a warming effect, which greatly reduces the lihood that sea life will flee in fear. Using the blue and green colors will raise the temperature, creating a cooling effect. Built for extreme durability as well as high performance, the light body and head are made from an aluminum alloy that has been anodized to resist corrosion. The emitter window is crafted from tempered optical glass with notable strength and clarity.